← What’s That Monkey on Your Back? It’s all about diet, says University of Zurich researcher Balthasar Bickel, in a study reported recently in the journal, Science. Bickel’s contention is that the move from a meat-heavy diet — and all the tearing, ripping and hard chewing that entailed — changed the configuration of adults’ jaws. Hunter/gatherers tend to have upper and lower teeth that close on top of each other. People with a diet heavier on cooked porridges, cheeses and yoghurts — all products of an agrarian society that includes cooked and stored foods — typically have an overbite. Their front teeth protrude in relation to the lower teeth. Read more about this research here. 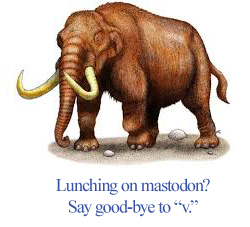 And then try to imagine what you’d sound like were you still hunched in front of a cave, lunching on mastodon.